Turkey day is upon us, University of Akron students. That means a few things: for one, you get a much-deserved academic break. Two, you get to enjoy some family time and catch up with old friends from back home. Lastly, and more importantly, you get to eat real food at home. As a bonus, Thanksgiving break means that there are only a few more weeks left in the semester. It’s gone by so fast! As you turn in your final assignments, take any last minute quizzes, and coordinate with fellow classmates on any group projects before you depart from Akron, you’ll want to make sure that your student apartment is also in good shape. If your roommate(s) will be also be gone for Thanksgiving break — and no one will be around for several days — read below for some simple yet important items to take care of before you leave. If you’re not going to use anything in your Akron apartment, then why keep it running or plugged in? Sure, devices that are turned off may not use too much power, but they’re still using a little standby power when they’re plugged in. Be good to the planet and your wallet by taking three minutes to unplug your power strips, appliances, lamps, or anything else that’s hooked up to an outlet. Yes, that probably seems like a lot of work. Yes, cooking and cleaning are probably the last thing on your mind when you’re hastily turning in schoolwork and packing your bags before catching a flight. However, with a little planning and effective time management, doing these things will make your life much easier when you return to Akron for the rest of the semester. Trust us. Even after stuffing yourself post-thanksgiving, you’ll still need to eat something decent when you get home. Cook up some veggies, chicken, and rice, and freeze the leftovers for a quick meal after break. As for cleaning, taking an hour to straighten up your apartment will make a world of difference when you return to a clean place. Why 65 degrees? This is the minimum temperature we recommend our Akron apartment community to set their units to when they leave so that your pipes don’t freeze. 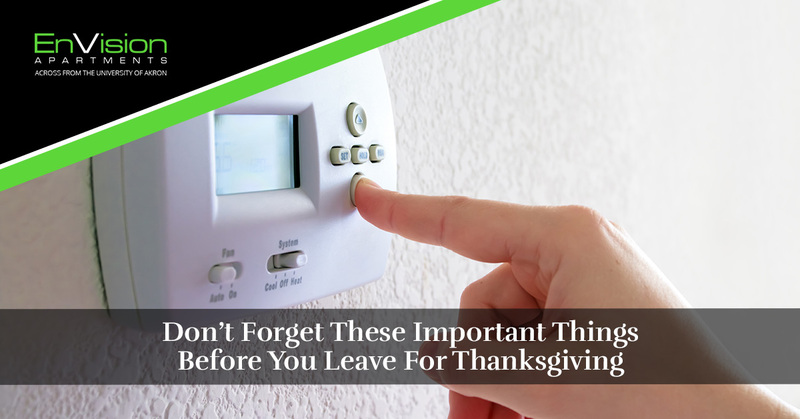 Not only will your pipes not freeze, but you won’t be wasting any unnecessary energy heating your apartment. That’s more money in your pocket! Above all else (besides remembering to turn your appliances off if they’ve been running), make sure to lock your windows and front door. It’s true that we live in a safe and trustworthy community here at the EnVision Apartments, but you’re better safe than sorry. The last thing you want is to realize that you left your front door unlocked when you’re in the middle of your flight — there’s not much that you can do at that moment! Don’t hesitate to contact our Akron Apartments with any questions about housing for next semester, our apartment features, and more.